This is the one. The world’s only all-Maduro cigar. The infamous black leaf through and through. Earn up to 184 Points Points. The world’s first all-Maduro cigar. The infamous black leaf from wrapper to binder to filler. Built with immense patience and an undeniable amount of skill, this cigar is the perfect realization of years’ worth of experimentation. 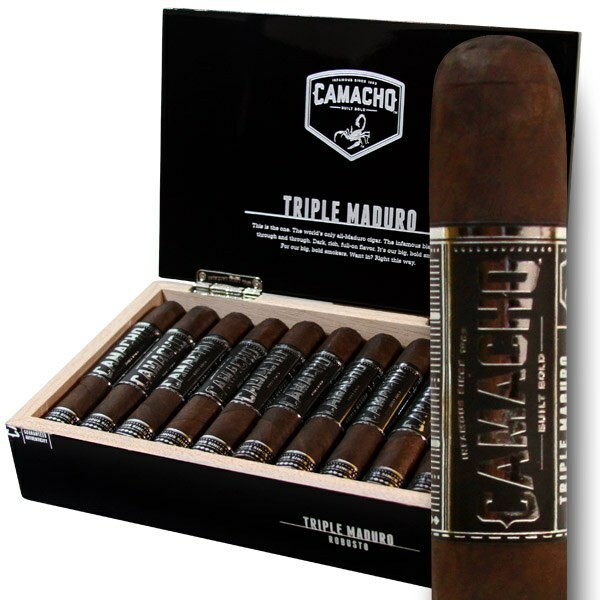 No other Maduro in existence can deliver the unique impact of Camacho Triple Maduro. Intensity from the start and all the way through, it has all the classic characteristics of a true Maduro… times three. Others have tried. All have failed. Camacho’s boldest smoke is dark, rich and full-on flavor. Built exclusively for our boldest smokers.